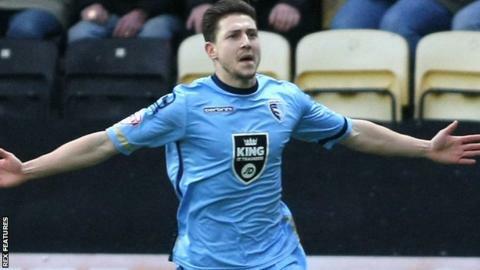 Striker Shaun Miller scored after just 54 seconds as Morecambe defeated Barnet in League Two. Miller clipped the ball over keeper Graham Stack and soon added another from the penalty spot after he was brought down by the Bees' goalkeeper. Alex Kenyon sneaked in unmarked to head a third before Barnet hit back through substitute Michael Gash's low strike. Cole Stockton's fine finish made it 4-1 before Gash added a stoppage-time consolation, his ninth of the season. "Within five minutes we could have been 2-0 down, which is a real surprise after the whole squad had done us proud over the Easter period with four points away at Exeter and at home to Luton. "We looked too open and to be fair to them, they played well. "When we stepped up in the second half, we probably had four good chances where we could have got back in the game. "It didn't really work for us today." Match ends, Morecambe 4, Barnet 2. Second Half ends, Morecambe 4, Barnet 2. Goal! Morecambe 4, Barnet 2. Michael Gash (Barnet) right footed shot from the centre of the box to the centre of the goal. Assisted by Andy Yiadom. Corner, Barnet. Conceded by Andy Parrish. Attempt saved. Matt Stevens (Barnet) right footed shot from the centre of the box is saved in the centre of the goal. Attempt missed. John Akinde (Barnet) right footed shot from outside the box is too high. Goal! Morecambe 4, Barnet 1. Cole Stockton (Morecambe) right footed shot from a difficult angle on the right to the top left corner. Assisted by Jamie Devitt. Substitution, Morecambe. Cole Stockton replaces Shaun Miller. Attempt saved. Matt Stevens (Barnet) right footed shot from the centre of the box is saved in the bottom right corner. Mauro Vilhete (Barnet) wins a free kick in the attacking half. Matt Stevens (Barnet) wins a free kick on the right wing. Attempt saved. Tom Champion (Barnet) right footed shot from outside the box is saved in the bottom left corner. Substitution, Morecambe. Paul Mullin replaces Lee Molyneux. Attempt saved. Shaun Miller (Morecambe) right footed shot from the centre of the box is saved in the centre of the goal. Foul by Lee Molyneux (Morecambe). Substitution, Barnet. Matt Stevens replaces Luke Gambin. Goal! Morecambe 3, Barnet 1. Michael Gash (Barnet) right footed shot from outside the box to the bottom left corner. Assisted by Sam Togwell following a set piece situation. Attempt saved. Luke Gambin (Barnet) left footed shot from outside the box is saved in the centre of the goal.